This is the true story of how the meat industry is manipulating our legislative process so that it can continue to abuse animals and workers while jeopardizing public health and our environment. The story begins in 2008 with the nation’s largest meat recall: The United States Department of Agriculture recalled 143 million pounds of potentially diseased and dangerous meat after an investigator from The Humane Society of the United States (HSUS) revealed systemic violations of the Federal Meat Inspection Act at Hallmark/Westland, the second-largest National School Lunch Program beef supplier. Day after day, the plant had been shipping meat to our nation’s schools from animals too sick and diseased even to walk, thereby putting our children at great risk for exposure to foodborne pathogens and other diseases and illnesses, including Mad Cow Disease. The Humane Society and federal government sued Hallmark for endangering the health of our nation’s school kids in violation of signed contracts. The case concluded last November when the plant’s owners agreed to a mostly symbolic (the company was already bankrupt) $500 million settlement. This investigation was just one in a long line of undercover probes by animal protection organizations. Every year, we see more of these investigations; sadly, every investigation finds new and horrific abuses of animals in violation of federal and state laws, often while on-site government inspectors look the other way. Responsible or savvy industries would answer this overwhelming evidence of flagrant and endemic law-breaking with a serious commitment to change their behavior. They would reform their practices to eliminate the culture of cruelty that seems to infest industrial farms and slaughterhouses. They would, as USDA consultant and slaughterhouse expert Dr. Temple Grandin has suggested, install video cameras to monitor for animal abuse and food safety problems, and they would hire independent inspectors to review the video and make sure that there was no gratuitous abuse and that dangerous meat was not being sold. Incredibly, instead of working to prevent the abuse, the meat industry is now vigorously pushing laws to prevent people from finding out about it — to make criminals not out of the animal abusers or those who foist dangerous meat onto school-children, but out of undercover investigators. That’s right: The industry’s response to years of evidence of egregious, and often criminal, animal cruelty and of diseased and adulterated meat entering the market is to attempt to outlaw undercover investigations. In 2011, the meat industry backed laws in four states to make taking photos or videos on farms and slaughterhouses illegal. In 2012, the industry pushed similar laws in 10 states. This year, we expect even more. These newest iterations of the whistleblower suppression bills have come in two new packages, both of which would protect illegal and unethical activity from ever seeing the light of day. The first version criminalizes making false representations while applying to work at an industrial farm or slaughterhouse. If you are affiliated with a charity that cares about animals, the environment, or workers, you don’t get the job. The intent of this bill is to block undercover investigators from, say, The Humane Society of the United States, Human Rights Watch, or Brian Ross’ investigative news team from getting jobs where they could witness and record abuse of animals or workers, illegal disposal of waste, or other unethical and illegal practices. The second version requires that any witnessed illegal activity be reported to authorities and all video documentation turned over immediately. It’s certainly possible that animal-friendly legislators are supporting this bill out of concern for animals, but, of course, undercover investigations, whether of a drug ring or organized crime syndicate or factory farm, require that the investigator document the full extent of the illegal activity. If the FBI or CIA stopped an investigation at the first sign of criminal activity, wrong-doers would be inadequately punished, if they were punished at all, because the full extent of the criminal behavior would not be known. Similarly, if an investigator witnesses illegal abuse of animals and immediately turns in that evidence without thorough documentation, the plant may receive a slap on the wrist (at best), the investigator leaves the plant, and business-as-usual continues. Of course, the real goal (and effect) of this bill is that no investigations happen in the first place. That’s why animal protection groups from the ASPCA to the Humane Society of the United States to my organization, Farm Sanctuary, are lining up against these bills, and no humane organization is supporting them. If these bills were good for animals, they would have the support of the humane community, not the meat industry. It is worth noting that time and again during undercover slaughterhouse investigations, plant management has been made aware of abuse (or actually has participated in it themselves), and federal inspectors were on site at all times. So, in addition to destroying the power of the investigations to begin with, turning in evidence of illegal activity to authorities before a full case can be prepared would be unlikely to result in any meaningful improvements whatsoever. For example, all of the abuses at the Hallmark plant, which sent millions of pounds of diseased meat into our nation’s schools, took place while no fewer than five federal inspectors were present. Yet, between 2004 and 2008, the USDA’s Office of the Inspector General reports that it “found no evidence that in-plant inspectors wrote [non-compliance records] or took suspension actions for humane handling violations.” In other words, the USDA inspectors knew of the abuse and did nothing to stop it — action was taken only after the HSUS’s investigation was made public. At a plant in North Carolina, workers violently kicked and stomped on turkeys among other sadistic abuses that led to multiple cruelty convictions. USDA inspectors did nothing to stop the abuse, and the state’s director of Animal Health Programs even tipped off the company to an impending raid (she was subsequently convicted of obstruction of justice). At a plant in Iowa, cattle had their tracheas ripped out and their throats slit open while they were still conscious; they were then dumped onto the ground, where 1 in 10 remained alive and struggling to stand for more than a minute. USDA investigators did nothing and no USDA personnel were fired after the abuse came to light. At a plant in Vermont, a worker used a shock pole to repeatedly shock non-ambulatory calves who were too injured to walk and then hit them at the top of their skulls with a captive bolt tool. The calves often remained conscious, bleeding and kicking for minutes, sometimes hours. A USDA inspector in the plant, Dr. Dean Wyatt, testified before Congress that he was reprimanded and threatened with termination by his supervisors for trying to report abuse at the plant. Every conviction of a slaughterhouse or industrial farm worker has come about because of an undercover investigation from an animal protection organization. And every one of these investigations would have been impossible and the dangerous Hallmark/Westland meat would still be pouring into our nation’s schools, if these states had passed any version of these whistleblower suppression bills. More than two-thirds of Americans “support undercover investigative efforts by animal welfare organizations to expose animal abuse on industrial farms, including 54 percent who strongly support the efforts,” according to a poll commissioned by the American Society for the Prevention of Cruelty to Animals (ASPCA). But they will be illegal in any state that passes any version of these anti-whistleblower bills. And whistleblower suppression bills don’t just harm animals, they also harm our freedom of speech, environmental efforts, and worker rights — which is why these bills are opposed by more than thirty charities, including The Humane Society of the United States, the ASPCA, the Sierra Club, the Southern Poverty Law Center, the Natural Resources Defense Council, and the United Food and Commercial Workers. Farm Sanctuary also opposes these bills. You can join our efforts to fight them by signing up for our email list. Factory farms have a lot to hide. We’ve all seen undercover footage exposing the horrendous treatment suffered by industry animals that a few brave individuals are able to bring light (as with the recent case involving dairy cow abuse by Central Valley Meat Co. in central California). Perhaps less obvious to the general public is the insidious environmental destruction that results from the massive amounts of waste produced by these operations. This waste degrades the surrounding land and surface waters in what most of us consider to be distant places. To local communities, however, the reality of factory farming is anything but hidden — the smell, the flies, the foul brown water all seep through the land they call home. View from above: a factory farm and manure lagoons. I recently had the opportunity to view firsthand the negative impact that factory farms have on the environment and their communities in eastern North Carolina. Farm Sanctuary’s Bruce Friedrich (senior director for strategic initiatives), Nick Ugliuzza (our photographer and videographer), and I were invited as guests of Robert F. Kennedy’s Waterkeeper Alliance, which provides support for communities standing up for their rights to clean water and for the wise and equitable use of water resources, both locally and globally. Among other laudable activities, Waterkeeper Alliance works to enforce Clean Water regulations by documenting water pollution and holding factory farms accountable. Waterkeeper staff member Larry Baldwin and volunteers Rick Dove and Joanne Somerday were our guides to some shocking sites. North Carolina is second only to Iowa in the number of hogs raised for meat in the United States, and it ranks second to Minnesota in slaughter of turkeys for meat. The chicken industry is also significant and expanding there; in fact, another large scale chicken facility is slated to be built in the state. The waste produced by these Concentrated Animal Feeding Operations (CAFOs) — more aptly described as animal factories — is overwhelming and destructive, and what we saw on our tour deeply saddened us. We flew over expansive manure “lagoons” on the properties of pig farms; we saw these operations spewing liquid pig manure onto fields, which then flows into surface water and pollutes the environment. Near a road outside one animal factory, we witnessed a cow standing chest deep in water laden with pig manure. We also observed sprinklers spraying liquid manure away from a farm, murky brown water flowing into a ditch, and miserable turkeys crammed into sheds almost the size of a football field. When we tried to speak with several “farm” owners about their methods and expansion plans, we were rebuffed. The local city council members who were called to meet with concerned citizens were either poorly informed, claiming ignorance about the chicken farm expansion plans, or worse, trying their best to curb any community-wide discussion about the issues. Case in point: The “heads-up” information on plans for expansion of these operations that should have been the starting point of an open dialogue with citizens was posted on a sign declaring that a new slaughterhouse was coming soon and that a meeting would be held to approve it. It’s clear that agribusiness enjoys an imperious influence over town leaders and government policies wherever factory farming sets up shop. 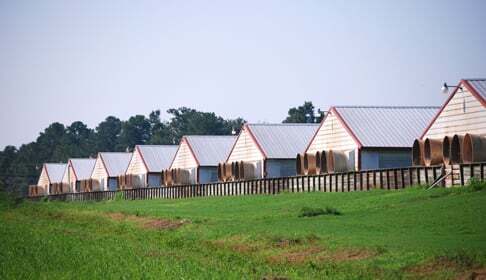 Row after row of expansive buildings housing tens of thousands of animals. Thousands of turkeys packed into one building. This trip showed me that people in any community adversely affected by factory farming must gather their voices, stand up, and be heard! It takes courage and fortitude to challenge assumptions and educate your own neighbors, local business owners, and local government leaders. I was inspired to see people in North Carolina stepping up and taking a stand. This type of activism is never easy, but it’s the only way local governments may begin to understand that the factory farming devastation must stop.